Based on the FDA’s request for additional warnings, it is believed that manufacturers had previously failed to properly warn doctors and patients of the risks of taking these drugs. The FDA press release can be accessed here. If you were taking any of these simvastatins, and suffered one of the injuries listed above, then you may be legally entitled to compensation for your injuries. Only by speaking with a qualified attorney can you determine your potential rights and options. Zocor is manufactured by Merck & Co., Inc. Recent studies have shown an increased risk of muscle injury (or myopathy) in patients taking 80mg doses of Zocor. It is part of a class of drugs called statins, which are used to lower cholesterol and help decrease the risk of heart attacks and strokes. Although all doses carry a risk of myopathy, the risk of developing rhabdomyolysis is greater for patients who are prescribed 80mg doses. The FDA reported that an estimated 2.1 million patients were prescribed 80mg doses of Zocor and other simvastatins in the year 2010 alone, while over 94 million simvastatin prescriptions were written. Myopathy is a state of muscle weakness, and can also include cramps, stiffness and spasms. The most severe form of myopathy is rhabdomyolysis, or rhabdo, in which the fibers in the muscles break down. This occurs when excess myoglobin (a protein) is released from muscle fiber and accumulates in the kidneys. Symptoms of both conditions include muscle pain, tenderness or weakness, and elevated creatine kinase (a muscle enzyme in the blood known as CK). In addition, symptoms of rhabdo include dark or red urine (a sign of the presence of myoglobin) and unexplained fatigue. Although rare, rhabdo is a serious condition that may lead to severe kidney damage and kidney failure, which can be fatal. Risk factors for developing rhabdo include poor kidney function, hypothyroidism, and being over the age of 65. The recent announcement and label changes follow the FDA’s warning in March 2010 of an increased risk of muscle injury in patients taking 80mg of Zocor. The March 2010 warning was based on a review of clinical trials, observational studies, adverse event reports and prescription use data. On June 8, 2011, after reviewing this data and the results of a more recent study, the FDA issued a recommendation to severely curtail the use of drugs containing 80mg of simvastatin because of the risk of muscle injury at these higher doses. The risk of developing myopathy is greater for patients taking certain other drugs (CYP3A4 inhibitors) at the same time as simvastatins, especially when taking high doses of simvastatin. In addition to Zocor and generic versions of simvastatin, the FDA’s warnings apply to other simvastatins, including Vytorin and Simcor. The FDA now recommends that no new patients be prescribed the 80mg dose. Additionally, patients currently taking a lower dose of simvastatin should not be increased to 80mg. What If I Have Been Injured By Zocor? 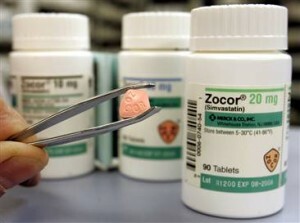 If you take or have taken Zocor or another drug containing 80mg of simvastatin and you have been diagnosed with rhabdomyolysis or serious myopathy, or you are experiencing symptoms such as dark or red urine, fatigue, muscle pain, tenderness, or weakness, then you should take the time to understand the legal remedies available. Please contact Lopez McHugh for a FREE consultation with a qualified and trusted attorney who can answer your questions and ensure your legal rights are protected. Call today because if you wait too long, you may be barred from recovering for your injuries by your state’s time limits.